Flying soon captured Nate's heart. 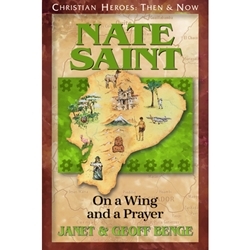 His air-service ministry to isolated missionaries put him on a path of destiny that would ultimately end with a final airplane flight with four missionary friends to the "Palm Beach" landing strip in the jungles of Ecuador. The men's lives given that day not only opened a door to the gospel for the unreached "Aucas"; it has been said that possibly no single event of the twentieth century awakened more hearts to God's call to serve in missions. (1923-1956).